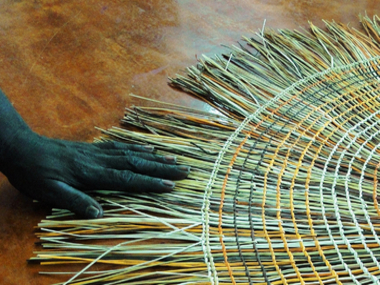 A celebration of cultural sharing through traditional and contemporary interpretations of ‘Raark’ painting, carving and weaving, by the artists of Milingimbi arts centre in Arnhem Land. 16 artists from Milingimbi, NE Arnhem Land, will travel to Brisbane where they will perform bunggul (ceremonial dance) and manikay (song) at the Opening Ceremony of their exhibition at Woolloongabba Art Gallery. The 16 artists and dancers are very excited about introducing their cultural practices to Brisbane, and will mark the occasion with a ceremonial presentation, a gift of a morning star pole to the people of Brisbane. This is to be accepted on behalf of the people of Brisbane by the Queensland Art Gallery at the opening event.